Flexible fixtures can be used in laser welding to positon and clamp workpieces with different shapes. For low volume production or small batch sizes, modular equipment or is available. 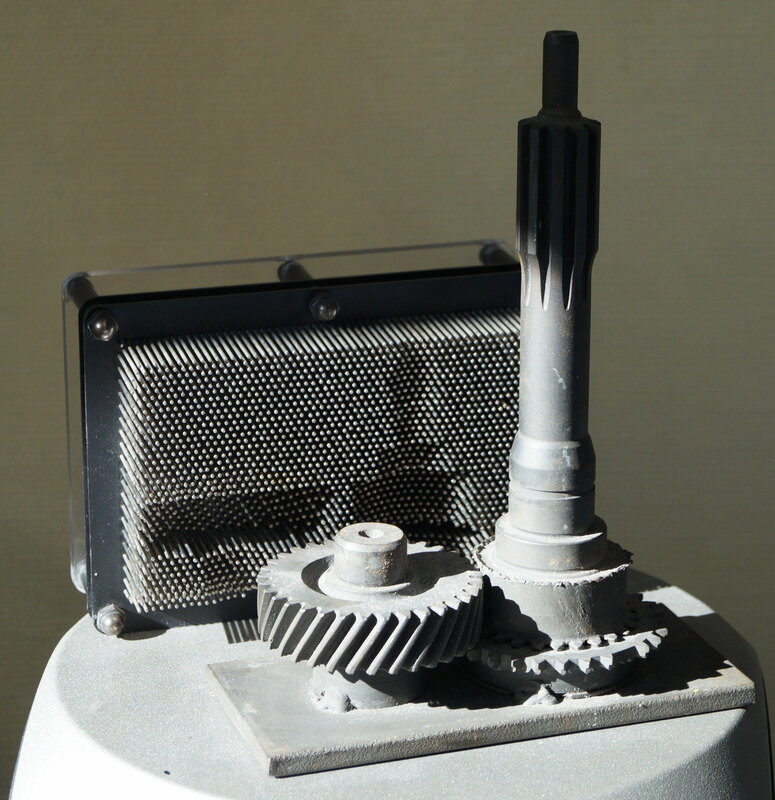 For larger quantities, hybrid devices with standardised parts allow good accessibility. 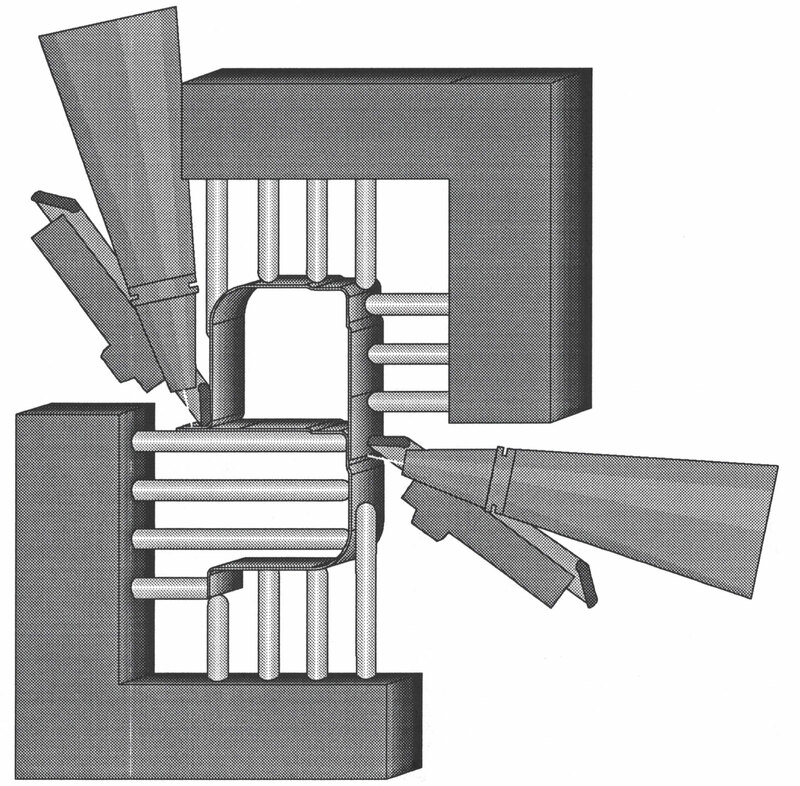 Differently shaped workpieces can be clamped very flexibly by a pin matrix. 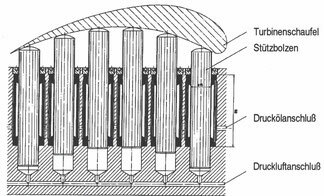 The pins are either pressed pneumatically onto the workpieces and then fixed by clamping sleeves, or they are pressed hydraulically, e.g. by oil, gel or a viscous paste against the workpieces. The practical suitability and cost-effectiveness of these concepts with hollow profile samples and real components on flexible fixtures should be further investigated within collaborative research projects. Flexible manufacturing systems can be used for a variety of tasks. In laser material processing, various types and variants can be positioned, clamped and processed in one and the same system at short notice, i.e. with little retooling effort, if suitable flexible jigs and fixtures are used. The small focus diameter of the laser beam and the high energy density result in a high degree of geometrical flexibility. Thus workpieces with a wide variety of two- and three-dimensional geometries can be processed, but small radii and poor seam accessibility may cause some limitations [EVER 92,122]. In high-volume production, especially in the automotive industry, the flexibility regarding types and variants, and the flexibility regarding batch size and order are key benefits of laser processing, if suitable fixtures are available [DVS 143.189]. Laser processing offers a very high flexibility, which makes the use of lasers attractive to the manufacturing industry. The economic use of lasers should by no means be restricted by the clamping devices, but should be facilitated as far as possible. 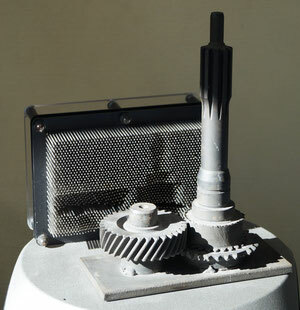 The large number of proces variants such as laser welding, laser cutting, laser drilling, laser marking, laser engraving and surface texturing enable the laser to be used as a universal tool for welding, cutting, coating, shaping and reshaping, coating, labeling and changing the material properties. As a result of this and the laser's batch size flexibility, it is possible, even for small and medium-sized companies, to use a laser system for a wide variety of production processes for the industrial production of smaller and smaller batch sizes [VDW 90.9]. Because laser resonators with different wavelengths are available, the flexibility of the material allows, the processing of a wide variety of materials apart from metalworking. These are, for example, plastic, glass, ceramics, wood, paper, as well as composite materials. By using a pin matrix, a highly flexible clamping device can be created. The company Kostyrka in Stuttgart offers slotted, hydraulically actuated clamping sleeves, which are used, for example, for clamping turbine blades. After placing and fixing the workpiece, the compressed air connection is pressurized with compressed air, whereby the support bolts rest against the workpiece contour. Subsequently, the support bolts are blocked by the clamping sleeves by pressurized oil, or - in welding fixtures - a non-flammable liquid pressure transmission medium, to a pressure of about 50 bar to keep the pins in the desired position. Replacing the support Pins with pins of different lengths allows the fixture to be adapted to extremely different workpiece shapes [KOST 93,20]. The airflow escaping between the stud and the surrounding area has a self-cleaning effect by preventing the ingress of cooling water and chips into the gap. Seals should therefore not be installed. The unclamped pin matrix can also be used as a compliant fixture. Investigations could demonstrate, whether in this case compressed air should be better replaced by plastic masses or high-viscosity elastomers. The company Kostyrka also supplies complete "hydro-supporters in cartridge form" for the construction of a pin matrix, which were originally developed for use in the aircraft construction industry. There, these are used in large numbers for supporting light metal components in milling machines. With a bolt diameter of 10 mm, a minimum displacement resistance of 3000 N per hydrostatic support is achieved at an oil pressure of 500 bar. Due to an outer diameter of the clamping sleeves of only 20 mm, a high number of support points is possible. If the bolts are removed temporarily, a jam should be provided for safety's sake, which prevents the clamping sleeves are clamped empty, which would lead to irreparable destruction. For heavy and insensitive parts, the sensitive adjustment with compressed air can be dispensed with. In these cases, the bolt is pressed against the workpiece by means of a positioning spring, which is clamped between two screws. When clamped, the oil is supplied via the pressure oil connection. The pin can be removed, when priming for the first use. For pressure equalization during piston displacement, air can be supplied from the outside through the ventilation connection, which is protected against contamination with a sintered metal filter. It must be ensured that no liquids, such as coolant or cutting oil, are sucked in. The opposite hole is closed by default because it is not needed in this application. The clamping sleeve is pressed against the housing bottom with a threaded ring, into which a smooth-running scraper is inserted. In the experimental investigation of flexible fixtures, the use of standardized components is recommended to simplify comparisons with the welding results of other investigators. At the Institute for Engineering Design of RWTH Aachen University, the easy-to-produce profile has for weldability studies was developed in 1993. Hollow profiles can be created by joining two profiles of this Kind to conduct experiments with different joint and seam variants. Through the use of different radii, flange widths and thicknesses b the demand for practicality is met. 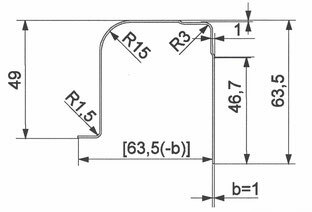 The largest radius of R = 15 mm allows investigations on three dimensional weld seams that can be created by an oblique cut through the profile [RADA 93,95]. The profiles can be put together without changes to 5 sensible pairs. If the longer sheet metal tab shown on the right side of the drasing is folded inwards or outwards again, there are 4 further combinations, so that also three-sheet seams and radii-side seams with laser beam trap can be investigated. The width of the profile is not set by default. If fillet welds are to be welded to the flange, experience has shown that a plate projection of the lower plate should be provided in the size of the plate thickness b, i.e. the profile width would be assumed to be 63.5 mm-b. When welding face seams with the same profile arrangement, the offset should not exceed ± 0.5 mm, so that the profile width in this case would have to be tolerated to 63.5 ± 0.5 mm. The clamping is used for welding corner seams. Similarly, it could also be used to weld I-seams to the T-joint by pushing the upper component slightly to the left. Depending on the flange and roller width, a less elaborately designed roller with external focus point could be used. With the profile combination resulting from the shift, it is also possible to carry out investigations on fillet welds on the T-joint. However, the role has no tolerance-compensating contact pressure, so that the thickness of the welding gap must be defined exclusively by the device. 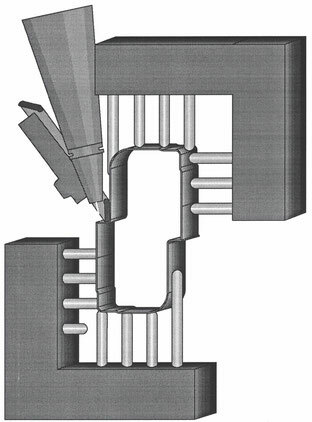 The concept for the flexible clamping of hollow profiles in a pin matrix, shown here schematically, was developed in 1994 by AluStir. The workpieces are clamped between the pins of two L-shaped matrices: in the vertical direction they are pressed against each other, and the horizontal positioning is carried out by pressing the parts against the side of some pins. Depending on the length of the components several rows of pins are arranged one behind the other. To avoid tilting of the components, the pins are not movable in during clamping. In the case of long components, due to the large leverage forces, it can be foreseen that a compliant system for tolerance compensation and for the accurate positioning of the laser beam could not be achieved by elastically displaceable pins. The L-shaped arrangement would also result in hard-to-predict frictional forces between the pins and the components. The compliance must therefore be established either between the component and the table or depending on the total weight of the components and the device in the robot wrist. By a pressure roller with internal focus point, the relative positioning between the beam and desired weld in the vertical and horizontal direction could be ensured. For making welding fillet welds on the flange or for making lap joints, the profile combination outlined here can be used. The clamping takes place by first pressing the lower profile from the left against the fixing pin, and then positioning the upper component from above and from the right against it. [DVS 143] Deutscher Verband für Schweißtechnik e.V. : 'Roboter '89.' DVS-Verlag, Düsseldorf, 1989. [EVER 92] Walter Eversheim: 'Lasergerechte Konstruktion und Fertigung.' VDI Verlag, Düsseldorf, 1992. [KOST 93] Kostyrka GmbH: 'Klemmhülsen - Kostyrka klemmt kraftvoll.' Kostyrka GmbH, Motorstraße 41, 70499 Stuttgart, 1993. [RADA 93] D. Radaj, R. Koller, U. Dilthey, O. Buxbaum, F. Welsch et al: 'Laserschweißgerechtes Konstruieren.' Daimler Benz AG, Forschung und Technik, Epplestraße 225, 70546 Stuttgart, July 1993.